Hardiness: Moderate. This is one of the easiest anemones to keep. Reef Safe: Medium. May kill some corals. Diet: Carnivorous. They also produce a part of their own nutrition by way of photosynthesis. The Bubble Tip Anemone (Entacmaea quadricolor), also known as bubble anemone, bulb anemone or simply BTA is one of the most popular anemone species in the aquarium trade. This species is native to the Indo-Pacific region including the Indian Ocean, Fiji, Tonga and the Red Sea, where it is usually found attached on coral rubble or in the crevices of solid reefs. They are often found in association with a number of clownfishes including: Amphiprion melanopus, A. frenatus, A. chrysopterus and Premnas biaculeatus. The appearance of the BTA can vary greatly from one individual to the next. It occurs in tan, orange, brown, red, pink, maroon and green colors with various combinations and patterns. Green and brown specimens are usually found deep inside the water and are solitary while specimens of other colors are colonial and are found at the water surface where there is ample light. Mature specimens from shallow waters have an average diameter of 12 inches (30 cm) while the deep sea variety can reach diameter of 20 inches (50 cm). Some Bubble Tip Anemone have bubble tips, some don’t and some have a mixture of bulb tips and smooth tips in the same animal. Some will bubble occasionally while some have huge bubbles at all times. This is perfectly normal. There have been many theories on this subject but none have been proven. Some claim that feeding may play a role in the formation of bubble tips while others say that anemonefish need to be present or that light intensity may be the key. Bubble Tip Anemones makes great addition to the reef aquarium but are unfortunately not easy to take care of. The first question you should ask yourself is how old your tank is. 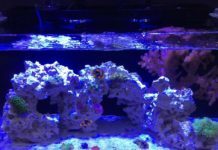 If your tank is not 6 months old (and stable), it is not ready for Anemones. If you don’t follow this simple rule, you will loose your anemone for sure. While you are waiting, buy some test kits and monitor your water quality. Anemones are not easy to keep. Actually, most won’t survive in aquarium so before to give that a try, make sure your tank is A++. When choosing a Bubble Tip Anemone, it is important to make sure it is healthy. Actually, many successful anemone keepers attribute their success to obtaining a healthy anemone in the first place. 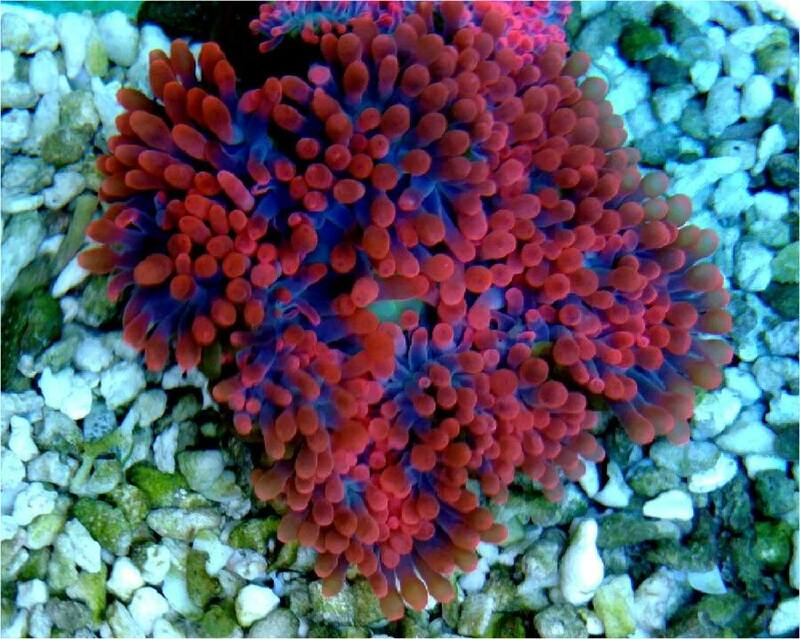 If it is a Rose Bubble Tip Anemone it should be a deep red or dark orange/red in color. If it is a Green Bubble Tip Anemone, it should be a medium to dark green in color. Unless you have money to lose, don’t buy anemones that are light pink or light green, white or see through. The mouth of the Anemone should be tightly closed. A wide open mouth is a bad sign. Although Anemones will excrete waste through their mouth, so it can be open at times. The foot (pedal base) of the Anemone should be whole and undamaged, and should be attached to a rock, side of the aquarium, or to the substrate. Foot lacerations can be deadly to an Anemone so make sure it is not damaged. If the Anemone is attached to a rock, buy the rock with the Anemone attached. Do not attempt to remove it from the rock. A healthy Anemone will react to the presence of food. Ask the retailer to feed it while you watch. No feeding response is a bad sign. The length of the tentacles can also give us some information about the overall health of the Anemone. Too short may not be a good sign. Also, remember that the health of the animal does not depend on bubbles. Some are bubbled, some are not. The Anemone can be bubbled in the store and never bubble in your tank or not be bubbled in the store and be bubbled in your tank. Once again, this is not a sign of health. 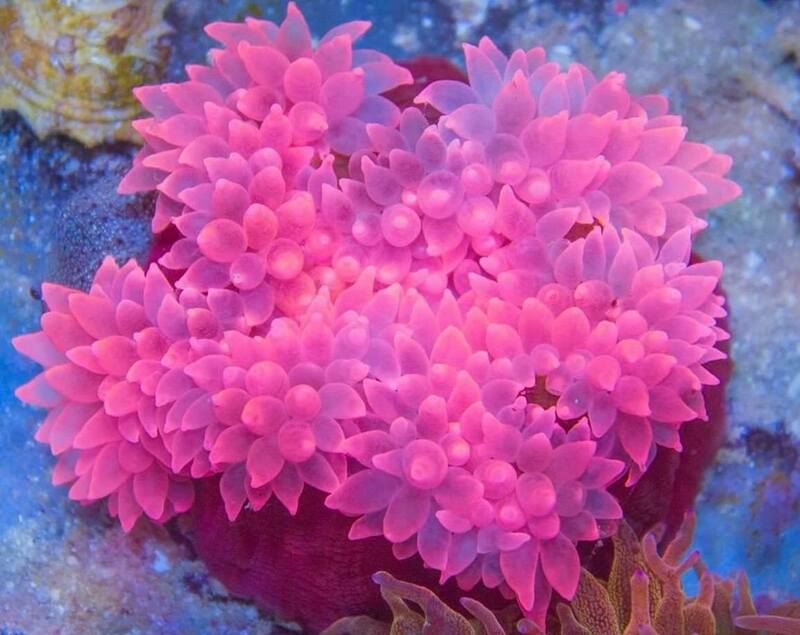 Tank size: Anemones need stability. The bigger the tank, the more stable. In my opinion, the Bubble Tip Anemone should be kept in tanks of 20 gallons or larger (20 gallon should be the minimum). 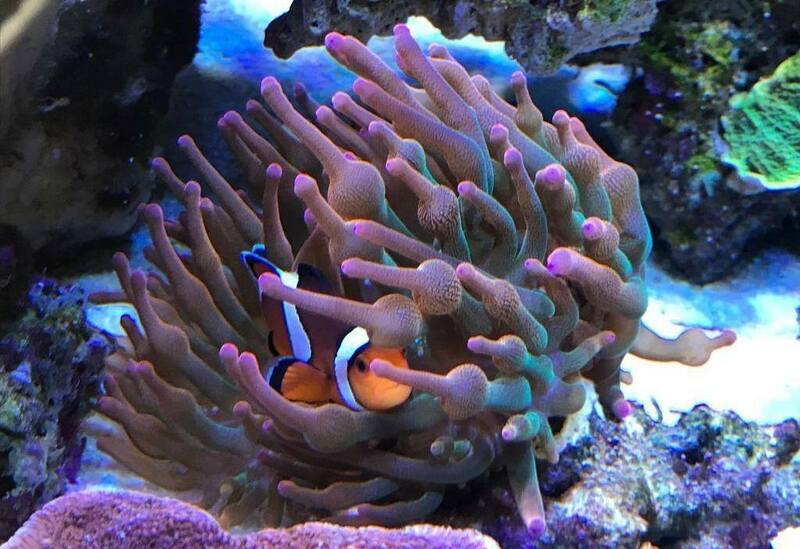 Keep in mind that an healthy Bubble Tip Anemone will quickly expand and that you need enough room to fit some kind of filter, a heater, power heads and some live rock in the tank. 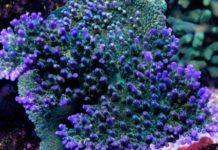 Read here our guide to set up a small reef tank. cked up. It is sometime difficult to keep power heads away from the Anemones in small tanks. Filtration: If your tank is small, it is possible to simply do weekly water changes and not use a protein skimmer (only in tanks with live rock) but I would not recommend this for a first experience. I tried it and I have to admit that even if I did not lose any anemone during that period, I went through many difficulties. I now use the AquaticLife Internal Mini Protein Skimmer on my 25 gallon tank and I really love it! A good water quality is the key so before to buy a protein skimmer, make sure to read reviews and try to get the best for your money. Lightning: Bubble Tip Anemones are medium light Anemone. They will thrive under VHO or Metal Halide lighting very well. I have kept them under 120W VHO for over a year with great success (that was a 25 gallon tank). Metal Halide are strong lights and the Anemone might hide from such bright light until fully adjusted. 150W Metal Halide on a 25 gallon tank (14 inches high). 120W VHO on a 25 gallon tank (14 inches high). 500W Metal Halide on a 150 gallon tank (24 inches high). Live Rock: I strongly believe that live rock is a must. 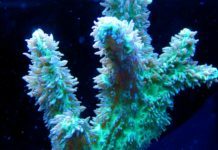 Live rock makes saltwater aquariums look more natural and it is an excellent biological filter. It also provides many hiding and opening where your Bubble Tip Anemone can attach. Live rock also allow the Anemone to climb up on and reach more light if they feel the need to. 1.5 to 2.0 lbs. of live rock per gallon of water is recommended. Temperature control: The Bubble Tip Anemone is a tropical species that require a water temperature of 72-78°F (22-25°C). Any heater will be enough to rise water temperature to the right level. If the temperature in your area reach higher levels, you should consider buying a chiller. 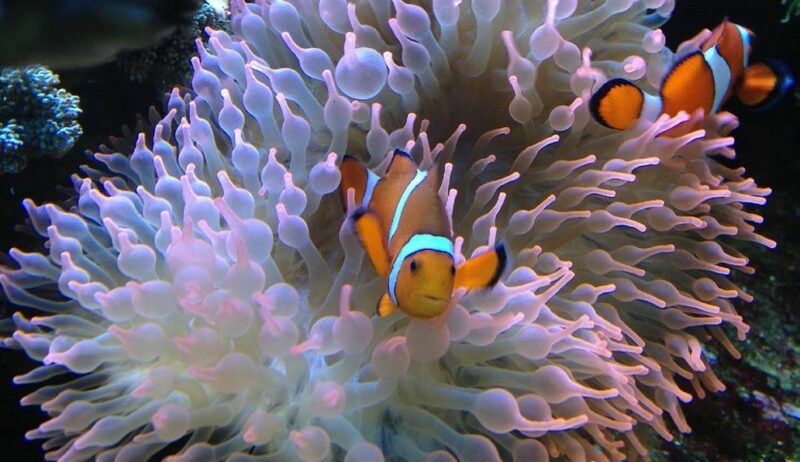 Some Anemone species and Clown Fish have a well-known “symbiotic” relationship. The anemone provides safety for the clownfish and in return the clownfish defend the Anemone by driving off potential predators and provides the Anemone with fertilizer (from its fences). What’s fascinating behind this relationship is how the clownfish avoids being killed by its host Anemone. The clown fish are not immune to being stung but their mucus coat protects them from the Anemone. There is a few theories about the source of the mucus. While some say that the fish produce it themselves, others say the clownfish rub themselves against the anemone, smearing anemone mucus over themselves. With this mucus from the Anemone, the clownfish fools the Anemone into confusing the fish for itself. Most Clownfish will not go into any anemone and there’s really no way to force a Clownfish to host. It is important to get the right clownfish for your anemone and to help you figure that out, let’s have a look at the following list where you’ll find which clownfish match each of the most common Anemone species. Depending on the species, Anemones can reproduce sexually or asexually. Sexual reproduction is how most Anemones species reproduce. Sperm and eggs combine and produce free-swimming lava. Successful sexual reproduction happen rarely in aquarium. 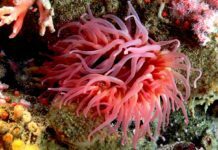 Actually, researchers at the National Marine Science Centre at Coffs Harbour have bred sea anemones in captivity for the first time in 2005. Asexual reproduction happen a lot in the aquarium. It happens by lateral fission or budding. The way this is works is that the Anemone splits itself into two different anemones. Only two of the 10 species that are natural hosts to anemonefishes can reproduce asexually : Entacmaea quadricolor and Heteractis magnifica. Splitting is usually related to stress or feeding habits. Water changes and major changes in chemistry can cause them to split. My Anemones split quite often in my 150 gallon reef tank. I bought the first one 3 years ago and I now have close to 20 of them. I feed them shrimp daily and change 20% of the water every month. It is also possible to cut an anemone in half to propagate it artificially. It appears that only anemones that naturally divide will predictably survive this treatment. However, the percentage of success is arguable (many end up with two pieces of one dead anemone). Species that does not split naturally do not have the powers of regeneration strong enough to heal from such trauma. This technique looks cruel to me. They propagate quite readily just by feeding them so I see no reason to propagate them artificially.